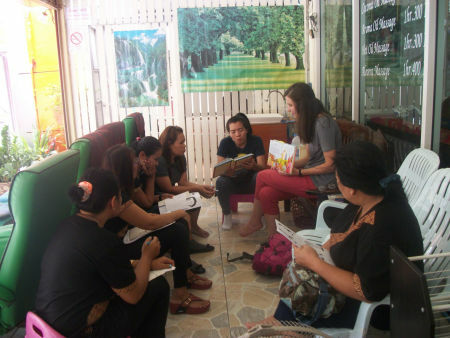 Our English classes, which are held at businesses downtown, are in full swing. My teammate, Kenzie, and I have been teaching these ladies since our first full week here, and we have been thrilled to see them improve their English and also hear God's Word - some of them for the first time. We use a story Bible. We read the story once in English, then one of our students will read it in Thai. The women also enjoy the illustrations that go with each story. This past week we taught on the crucifixion and resurrection of Christ. We explained that all of Christ's life and ministry was leading up to the moment when He would take on the punishment we deserved so that we could be restored in relationship with Him. We shared how His resurrection proved victory over sin and death. "What do you think about this story?" "Have you heard this before?" One of our students responded: "I have never heard this before. I had heard of Jesus, but I didn't know why He had to die. I didn't know He rose from the dead and that He is still living." After we explained a little more to her, she said she wanted to follow Jesus! We look forward to sharing more about God's Word with her in the weeks to come. This past week while we were out prayer walking and sharing, we saw a young woman selling fruit, wearing a T-shirt that read, "I love Jesus." We were surprised to see this, so we walked up to her and asked her if she was a Christian. She told us she was and that she came to faith in Christ at a young age at a children's home where she grew up. Her name is Fi, and we were so excited to meet her that we asked to take a picture with her. We also got her contact information, and we are hoping to meet up with her again. On Wednesdays and Fridays, my team is working with a ministry that trains disadvantaged women who have unplanned pregnancies to parent, handle finances, and learn job and life skills from a Biblical basis. This week, two new moms arrived and we are excited to get to know them better! Please be in prayer for our English classes, that our students will receive the words of the Bible as truth and respond in faith. Pray for continued opportunities to talk with people who are open to hearing the Gospel. My team is really thankful that we have seen this prayer answered every week! And please pray for our friends who have heard the gospel and want to know more.